The head of the Royal Navy has warned that the fleet will not be able to continue the current scale of operations around Libya beyond the summer unless ministers take tough decisions about what they want to prioritise. Admiral Sir Mark Stanhope, the First Sea Lord, said the navy had planned for a six-month commitment but that the government would have to make "challenging decisions" about what it wanted to do thereafter. Stanhope also conceded that if the aircraft carrier Ark Royal and its Harrier jump jets had not been mothballed last year, they would have been deployed to the Mediterranean. This would have been cheaper – and made operations more reactive – than flying planes from the Italian base at Gioia del Colle, he said. But he insisted the constant jibes about the loss of the ship and the aircraft were having a "corrosive" effect on navy morale. "There is far too much about what could have been," he said. Stanhope's remarks come amid growing concern within the Ministry of Defence (MoD) about the prolonged nature of the Libya effort and its cost. They also come just days after the US defence secretary Robert Gates mocked some allies for already running out of ammunition. 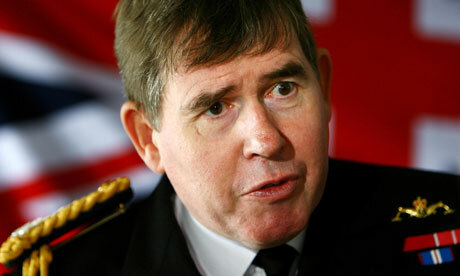 In a briefing at Admiralty House, Stanhope said: "How long can we go on as we are in Libya? Certainly – in terms of Nato's current time limit that has been extended to 90 days – we are comfortable with that. "Beyond that we might have to request the government to make some challenging decisions about priorities. "There are different ways of doing this. It's not simply about giving up standing commitments, we will have to rebalance." Stanhope denied this would involve a review of the cuts set out in last year's Strategic Defence and Security Review (SDSR). Afghanistan remains the MoD's top priority, and officials are adamant that the effort there will not be compromised for the Libyan campaign. But Stanhope made it clear that he did not have enough ships to continue the relatively small operation in Libya without something else having to give. "If we do it longer than six months we will have to reprioritise forces," he said. "That is being addressed now. It could be from around home waters. I will not prejudge what that decision will be." The navy currently has one destroyer, HMS Liverpool, the mine clearance vessel HMS Bangor, a Trafalgar class submarine and the helicopter carrier HMS Ocean off the coast of Libya. At the start of the conflict the navy diverted HMS Cumberland to the Mediterranean as it was returning to the UK to be scrapped. Stanhope also admitted that the navy was having to buy more Tomahawk cruise missiles from the US to replace the ones it had already fired. Stanhope has been frustrated in recent months by ongoing criticism around the decision to axe Ark Royal – a replacement carrier, the Prince of Wales, will not be ready for service until 2020. But he said it was time to move on from the debate. Even though there is a study under way within the MoD about the cost of axeing the Harriers and what it would take to bring them back into service, Stanhope said he did not believe the aircraft would fly again. "If we had Ark Royal and Harriers in February, I feel relatively assured that we would have deployed that capability off Libya to conduct the ground [operations], not the air defence piece which the Harrier was not capable of achieving. "The pros would have been a much more reactive force. Rather than deploying from Gioia del Colle, we would deploy within 20 minutes as opposed to an hour and a half, so obviously there are some advantages there. "It's cheaper to fly an aircraft from an aircraft carrier than from the shore. "Do I feel bitter? No. It's a reality of where we are. I keep saying this. We have to look forward and go for what is in the pipeline which I have already indicated is challenging enough. There is far too much about what could have been as opposed to what is." The navy and RAF suffered disproportionately from the SDSR, having to cut 5,000 jobs each, as well as losing ships and aircraft. The head of the RAF, Air Chief Marshall Sir Stephen Dalton told the Guardian there would have to be a significant uplift in spending after 2015 if the service is to meet its commitments in the future. Stanhope reiterated this and said the government had acknowledged more spending was necessary. Liam Fox, the defence secretary, said: "Operations in Libya are showing how capable we are post-SDSR as a leading military power with the fourth largest defence budget in the world. We continue to have the resources necessary to carry out the operations we are undertaking and have spare capacity with the Royal Navy taskforce which is currently on exercise in the Gulf. "The SDSR is not being re-opened. The Harrier has served with great distinction over a long period and in a number of theatres, but we are not bringing them back into service. Our planning assumptions remain valid and we have been able to effectively conduct missions over Libya. We are now progressing with the disposal of the Harrier force."